This is a tour like we will probably never do again. It’s the BIG version. We have the band – Kieran “The Voice” Rafferty, Steve Pretty from the ridiculously good Hackney Colliery Band, Gemma Storr who is currently touring around the world with Bryony Kimmings and we have Tom Parkinson our Musical Director who is dusting off his instruments and joining us. Then we have me and of course my dad – Mike Melody “the antiques dealer off the telly.” And the best bit we are performing with incredible local brass bands. In addition to the shows we will be running workshops, holding talks, doing antique valuations and allsorts. Look on the festival websites for updates. I can finally tell you that we will also be performing at the Brighton Festival as part of Caravan. It’s a biennial showcase in which international delegates are invited to see the work. So hopefully we will get to tour the World next year. When we were performing at Battersea Art Centre and dad was away from home for a month. I asked mum if she wanted to come and visit. She said, “Why would I? Without dad the house is like a spa hotel.” I guess mum’s not coming on the World tour then. I am working with the BAFTA award winning Joe Murray to cut together the incredible footage we filmed in the temples of India, the shopping malls of Russia, and UK hair salons and forensics labs. We only got to use a tiny bit of the footage we shot for Hair Peace in the theatre show. So I am really exciting that this footage will be getting the exposure it deserves. Oh, and I’ve started doing stand up comedy but nobody (even Mitch) is allowed to come and see me yet. You can buy the book of Ugly Chief from my sparkly New Shop. 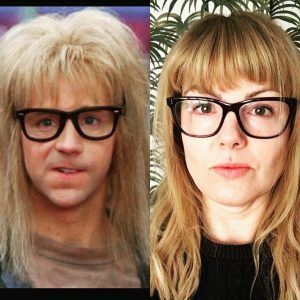 Mitch says I look like Garth from Wayne’s World. AND he’s right! But it’s an improvement from my university days when I looked like Noddy Holder. Hopefully see you at a gig soon. Theatre though, not stand up, I’m not ready yet.